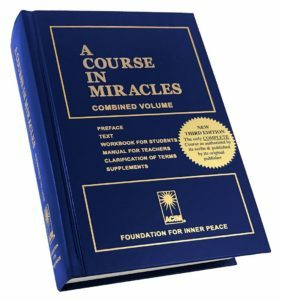 A Course in Miracles is something of a phenomenon that has affected the lives of many thousands of people. This three-volume set of books was received through a process of inner dictation by a psychologist at Columbia University, beginning in 1965. After ten years of preparation, the Course was first published in 1976 by the Foundation for Inner Peace. Since then, more than three million of these books have been sold, without the benefit of any paid advertising, to men and women in every walk of life and every major faith. The Course consists of a 669-page Text, which describes the theoretical foundation upon which its thought system is based; a 488-page Workbook for Students, containing 365 daily lessons that are designed to train the mind of the student along the lines set forth by the Text; and a 92-page Manual for Teachers, which answers some of the questions most likely to be asked by one studying the Course, and clarifies some of the terms used in the books. While the Course is primarily a self-study program, many hundreds of study groups have been established worldwide. On one level, A Course in Miracles is a restatement of the core of wisdom found in every major world religion. However, the Course is a spiritual teaching rather than a religion. While it uses Christian terminology, it is ecumenical in nature and states that “a universal theology is impossible, but a universal experience is not only possible but necessary.” The Course makes no claim of being “the only way,” but clearly states that it is only one of many thousands of forms of “the universal course” that can be used for personal transformation. The language of A Course in Miracles is extraordinarily rich and profound. Many sections of the Text and Workbook are very poetic and written in blank verse, and have led some people to compare the Course with some of the world’s great literature. The thought system of the Course is intellectually sophisticated, and combines spiritual inspiration with deep psychological understanding of such phenomena as belief and defense systems, perception and identity. However, A Course in Miracles is also very practical. The daily Workbook lessons provide a systematic, step-by-step approach by which one can apply the principles of the Course. The lessons do not require a lot of time nor long practice periods, but they do require a willingness to question every value one holds as to what the world is all about, and the willingness to see things differently–through the eyes of God. A Course in Miracles teaches that there are only two basic thought systems, one of perception and the other of knowledge. The thought system of perception is inherently illusory because it is based upon interpretation, not on fact. It is founded on our belief in our separation from God and from one another. From this flows a belief in evil, sin, guilt, fear, and scarcity. It is a world of appearances, of birth and death, of time and constant change. This thought system of perception is what the Course calls the ego, which is actually a set of beliefs that center around the body as our reality and the limit of our being. The world of knowledge, on the other hand, is truth. The Course teaches that the real world, which reflects truth, can be seen only through spiritual vision, and not through the body’s eyes. The world of knowledge is one of unity, love, sinlessness and abundance. The Course views reality as composed only of God’s thoughts, which are loving, constant, timeless and eternal. Evil, sin and guilt are regarded as misperceptions. Sin is regarded as lack of love, or as a mistake calling for correction and love, rather than for guilt and punishment. Unlike some other thought systems, A Course in Miracles does not suggest withdrawal from the world. It teaches that our relationships offer us unique and valuable opportunities for learning, awakening and healing. The Course offers a variety of approaches by which relationships based on fear and lack can be healed. Forgiveness of ourselves and others provides the means by which we can use relationships to let go of the past with its burden of guilt and grievances. In the context of the Course, “forgiveness” means recognizing that what you thought your brother did to you has not occurred. Forgiveness does not pardon sins and make them real. It sees that there was no sin. Forgiveness shows us only the extensions of love or the calls for love, not the attack or hate. By changing our perception in this way, we can remove the blocks to the awareness of love’s presence, which the Course says is our natural inheritance. A goal of A Course in Miracles is to train us to listen to God’s voice, the Holy Spirit. This extension of God’s mind serves as our inner guide, who will direct our thoughts, telling us exactly what to do, and directing all our efforts. To be truly effective, we must learn to rely on our own internal teacher rather than looking for help outside ourselves. We are thus guided to discover our own God-given function. As we are led from the world of the ego to the world of love, our perception of ourselves as separated persons is corrected, and we remember our higher, or true Self. We remember we were created by God as His Child, and we are enabled to accept the Christ within, and to see with Christ’s vision. We recognize our oneness with God, our Self, and all our brothers, and are able, finally, to “teach only love,” which is our true function as Children of God.